Meet rockstar in the making MORIAH FORMICA. At sixteen years old, she has already mastered a level of musicianship that many only dream of reaching. Dubbed “the future of rock” by Stryper’s Michael Sweet, and racking up praise from the likes of Halestorm’s Lzzy Hale, it is a sure bet that this is only the beginning for the New York native. 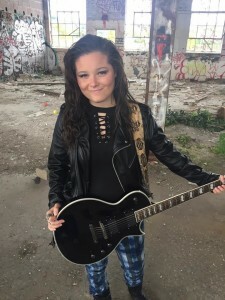 MORIAH FORMICA’s debut EP “Bring It On” strikes the perfect balance of hard rock and pop rock— a combination that will entice current rock fans as well as the next generation of rockers that have yet to be exposed to the genre. “SLAVE”, the first track off the EP, is a powerful anthem that will resonate with anyone who’s ever felt helpless yet determined to make a change in their lives. Want to keep rock alive? Show your support for up and coming, beyond talented, fearless artists like MORIAH FORMICA. Grab her album on iTunes. You won’t regret it. Q: What was your inspiration for writing “SLAVE”? MORIAH FORMICA: I had some personal struggle, which is the theme of my entire EP. The song “SLAVE” is about not letting anything or anyone stop you from living your life and doing what you were meant to do. Q: What’s your favorite lyric from “SLAVE”? Q: Describe your sound and style in a five word phrase. MORIAH FORMICA: It will make you feel. Q: Who/what are your biggest influences? MORIAH FORMICA: my biggest musical influences have been Aerosmith, Evanescence, Halestorm, and In This Moment. My first musical love was Aerosmith. I became obsessed with them at six years old, and can tell you anything about them and any song they have. My room is called Aeroville because it’s decorated with everything Aerosmith. So they kind of kicked off my love for music. My writing is probably more influenced by Evanescence and Halestorm though. Although new stuff I’ve been writing is different in many ways. MORIAH FORMICA: Albany, New York. Q: When is your next local gig? 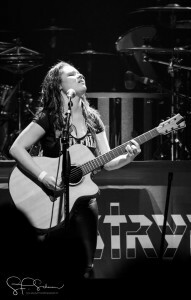 MORIAH FORMICA: I just played The Stone Pony and Gramercy Theatre opening for Stryper a couple months ago. I don’t have any NYC or NJ gigs booked at the moment, so if anyone out there is interested in hearing me…hit me up at info@moriahformica.com. Q: What’s your favorite song to play live and why? MORIAH FORMICA: “Bring It On”, because it has so much energy and a long, rocking bridge. Q: You’ve got a great collaboration with Stryper’s Michael Sweet on your album. How did you guys connect? MORIAH FORMICA: He had an acoustic show at a place near where I live called Chrome Food & Spirits, and I had the opportunity to open for him acoustically. He was very impressed with my set. He kept coming out to see what I was doing. After the show we exchanged information, and he reached out to me a month later and asked if I’d be willing to sing a song on his upcoming solo record called “One Sided War”. I was like…Yeah! The song is called “Can’t Take This Life”, and I love it. The whole record is awesome. So, after that experience of recording the song with him, I asked if he wouldn’t mind coming in and doing some lead guitar stuff and harmonies on my song “Bring It On”. So he came out and we collaborated to have him put the killer lead parts and solo that are on that song. Q: You are an incredibly talented and driven sixteen year old. How do you manage your time with your career and school? MORIAH FORMICA: I do what I have to do to get by in school because I know it’s important, but honestly music is my passion and what I plan on doing the rest of my life…and why not go after it when I’ve been getting so many cool opportunities. MORIAH FORMICA: Anything and everything I hope. The songs on this EP were written from fifth to eighth grade, and I’m in eleventh grade now, so I have so many songs written, and can’t wait to record again. Q: Heat wave or blizzard? MORIAH FORMICA: Definitely heat wave, although I do love when it snows around Christmastime. I just prefer heat, and I do own a lot of reptiles, so I guess in a way I’m a lot like them haha. Check out MORIAH FORMICA at www.MoriahFormica.com and grab her album on iTunes. Photo Credit Schaum Photography and Mark Marotta. 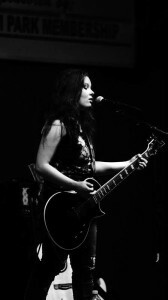 Madysin Hatter is a Singer/Songwriter/ROCKER. Have a song you’d like to have featured? Visit www.MadysinHatter.com to submit.